I needed to update my box of cards for work. The box that sits at my desk for when I 'miss an occasion' or do not want to, and for those that know I have it, they will also purchase cards for occasions... ANYWAY, I needed to get more in there, and swap out some that have been in there. I started to make this card, and knew it wasn't ever going to make it in the box, heck, I knew exactly who was getting it. She is surrounded by men in her family... shes a mother of 3 boys, all under 6.. or something.. so young that I cannot believe she so sane! Ha ha. Its been nice getting to know her and her family over the last few weeks and the lucky gal gets to celebrate her birthday while on vacation! Lets hope the hubby votes for some Adult time on this day!!! It's alittle of everything. Some punches, some pearls, some cut outs and laying. 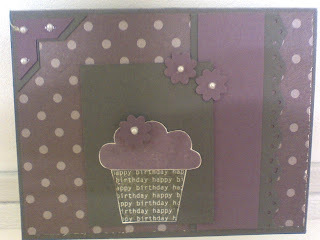 I chose Perfect Plum and Grey, since I haven't used either color in any way in a long time. As a matter of fact, I cannot even remember the last time I used Perfect Plum. I have to mentally make note to use more often. 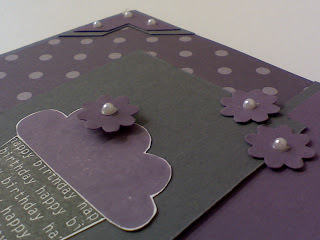 I used more of the Perfect Plum paper on the inside of the card, with the Eyelet punch before laying Whisper White on it, to put my birthday sentiment on. 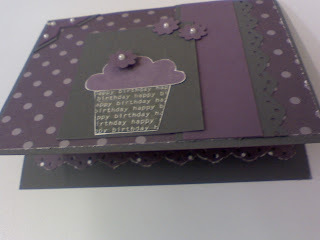 Alittle fuzzy- sorry, but the card as a whole! I will swap out the current colors for some others. Of course, I need to remember the Perfect Plum while I do some of them! !